Middle East Water Heater Market size for 2017 was over USD 1 billion and the annual deployment is set to exceed 9 million units by 2024. Increasing demand for energy efficient systems coupled with favorable regulatory policies toward carbon emissions will foster the Middle East water heater market. The green growth strategies adopted by the GCC countries including solar powered heating solutions will favor the product demand. For instance, in 2016, UAE invested USD 6 million across the region for the implementation of green strategies. 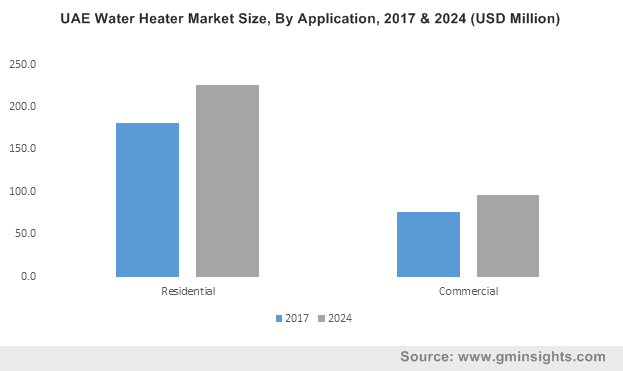 Favorable geographical scenario along with consumer proclivity toward adoption of sustainable heating systems will stimulate the Middle East water heater market. Significant economic transformation owing to accelerating urban population along with increasing demand for high end technological solutions will positively influence the product adoption. According to the U.S.- U.A.E. Business Council, the UAE government is aiming to comprise energy mix to 44% renewables by 2050. Instant water heater market is set to grow on account of increased system efficiency and limited maintenance requirements. Increasing penetration of product across commercial & residential establishment on account of continuous hot water supply requirement will complement the industry growth. 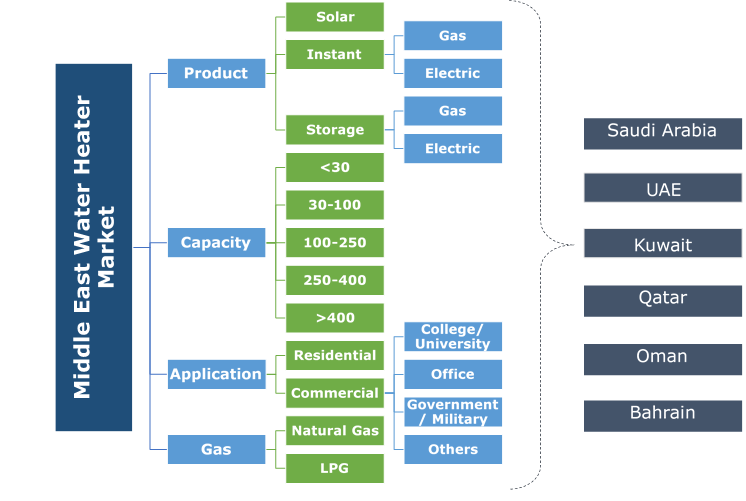 Fuel flexibility & high flow capacity are some of the prominent features which will further encourage the product adoption. Storage water heater market in 2017, accounted for USD 900 million. Increasing need for continuous water supply across the commercial & residential establishments will favor the product adoption. Limited maintenance and repair requirement, ease of accessibility and effective protection against firm water are some of the key features which will positively influence the product penetration. Demographic shifts in the urban population along with lower electricity prices across the region will propel the demand for below 30-liter water heaters. In addition, the increasing demand for heating technologies on account of growing investments toward real estate development will boost the Middle East water heater market. Ongoing construction spending toward the upgradation of existing commercial establishments will stimulate the demand for 30-100 liter water heater capacity across the Middle East water heater market. In addition, an appreciable increase in per capita income on account of rapid urbanization has reinforce affordability and accessibility of these products across the region. In 2017, the World Bank reported that 64.9% of the Saudi Arabia population will reside in urban areas by 2020. Natural gas water heater market will witness significant growth on account of favorable norms by respective government authorities toward the adoption of fuel for household heating purpose. For instance, approximately 20% of the household energy cost are spent on heating water, which can be curbed through the use of these heating technologies. LPG water heater market will grow owing to its higher efficiency when compared with its competitive counterparts. Lower operating costs coupled with quick recovery rate are some of the key parameters which will boost the product demand. Residential water heater market is anticipated to witness growth over 3% by 2024. Increasing demand for heating equipment across the households on account of rising disposable income will enhance the Middle East water heater growth. Stringent government regulations toward implementation of eco-friendly alternatives along with unprecedented demand to replace the conventional heating systems has instituted a favorable business scenario. Commercial water heater market will expand on account of introduction of advanced water heating technologies along with ongoing investments toward reinforcement of conventional infrastructure. In addition, the shifting trends from oil & gas-based economies toward tourism sector will positively influence the product demand. Saudi Arabia water heater market is anticipated to grow over 2% by 2024. Introduction of various large-scale projects including the Kind Abdullah Financial city is intended to reform the national infrastructure & will create prospects of expansion. In addition, the ongoing initiatives toward construction of residential buildings on account of growing urban population will stimulate the industry growth. For instance, the government of Saudi Arabia has initiated the development of 20 major projects with projected investment of around USD 293 million. Favorable government regulations toward reducing emissions coupled with sustained electricity prices will encourage the UAE water heater market. Ongoing investments toward the development of sustainable energy technologies along with introduction of green building codes and standards will favor the product demand. In addition, the increasing spending toward the replacement of existing conventional heating systems will boost the industry growth. Eminent industry players catering across the Middle East water heater market includes Ferroli, Whirlpool, Bradford White, A.O. Smith, Himin Solar, Rheem Manufacturing, State Industries, Rinnai Corporation, Hubbell, Linuo Ritter, Ariston Thermo, Saudi Ceramics, Jaquar, Kanch, Viessmann, Bosch, Haier & Vaillant. Major players across the value chain are focusing toward technology upgradation and innovations along with several merger & associations to improve the product line. Technological advancements are further fulfilling the rising demand of energy-efficient products. Water heaters are system that operate on an energy source including solar, gas and electric to heat water for residential and commercial applications. These systems use a heat transfer process to heat water above its initial temperature from an energy source. These products are deployed to transform thermal energy from a fuel source to a steam of water or a reservoir.